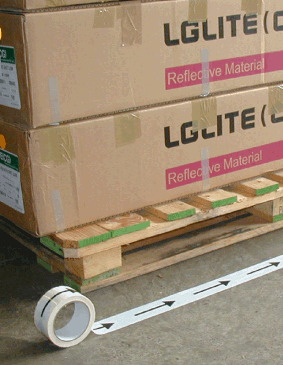 Safety and floor direction tapes are used widely for indicating traffic or pedestrian flow. These can be used on internal, sealed floor surfaces in factories, warehouses, hospitals and sport facilities. They are suitable for light traffic levels. These two-ply, self adhesive, directional arrow tapes are waterproof and are resistance to abrasion, water, chemicals and cleaning products. Choose from a selection of six colour combinations. We also supply Safety and Floor Marking Tapes, Laminated Warning Tapes, Reflective Tapes, and Fluorescent Tapes. Safety and floor direction tapes, black arrow on yellow. Safety and floor direction tapes, black arrow on white. Safety and floor direction tapes, black arrow on orange. Safety and floor direction tapes, white arrow on red. Safety and floor direction tapes, white arrow on green. Safety and floor direction tapes, white arrow on blue.